The decision to award a Nobel Peace Prize to the International Campaign to Abolish Nuclear Weapons is sensible given the award’s disarmament criteria. 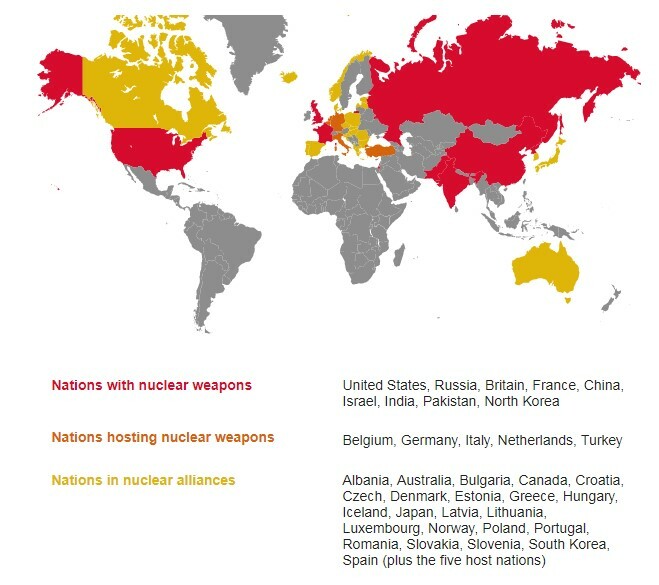 But UN meetings in September saw a wide gap among Russian, Chinese and US assessments of the causes, consequences and solutions regarding nuclear proliferation. Given these divisions, severe challenges remain in realizing a nuclear-free world. US Secretary of State Rex Tillerson, while visibly differing with Trump on many issues, aligned fully with his boss on nuclear proliferation. In contrast to Trump’s stark rhetoric, the secretary provided a more analytical framework for US nonproliferation policies in a September 21 UN Security Council session devoted to the issue. Tillerson contrasted the costs incurred by countries that illegally pursue nuclear weapons with the gains to those, such as Ukraine, that have renounced nuclear weapons. He noted that any country possessing this technology bore onerous burdens and responsibility for its safeguarding. Even so, he justified US nuclear forces as helping avert wars and decreasing allies’ need for their own nuclear arsenals. Tillerson called for greater international cooperation against further proliferation since the spread of nuclear weapons is inherently destabilizing and escalatory. He noted that any country that newly acquires nuclear weapons would lack the sophisticated safeguards of the experienced nuclear powers, raising “the risk of miscalculation, accident, or escalation.” Even worse, the possible acquisition of these capabilities by “irresponsible third parties” such as Iran and North Korea would be especially dangerous since these regimes pursue nuclear weapons as shields for regional aggression and subversion rather than self-defense. To counter these dangers, he proposed fortifying the Non-Proliferation Treaty against further cheating or circumvention. According to Tillerson, Russia and the United States have “the greatest responsibility for upholding nonproliferation” due to their large nuclear arsenals and prior collaborations. Yet he related how Moscow has recently violated arms treaties, impeded nuclear security cooperation and limited investigations of illegal nuclear weapons programs. Tillerson also saw China as another crucial, if underperforming, partner in averting nuclear proliferation. In his view, a stronger stance by Beijing would go far toward ending North Korea’s nuclear weapons program. Regarding nuclear terrorism, Tillerson saw enhanced collaboration among Russia, China and other countries as critical for preventing non-state actors from obtaining nuclear materials, technologies and expertise. He advocated increasing intelligence collaboration, more effectively executing UN Security Council resolutions, and renewing multilateral efforts to provide alternative employment for former nuclear weapons specialists. For him, all “levers of power, whether diplomatic, economic, digital, moral, or, if necessary, military,” should be pooled to counter proliferation, deter rogue regimes and kill terrorists. In Beijing’s view, pressure is only productive in pursuit of negotiations and dialogue. In the case of North Korea, Wang saw negotiations as “the only way out.” He said that all the parties to the nuclear dispute should meet each other halfway by addressing one another’s legitimate concerns.” For the United States, this means adhering to the “Four Nos” that Beijing claims Tillerson agreed to on August 1 – no pursuing regime or government change in Pyongyang, striving for rapid Korean reunification, or sending the US military into North Korea. The visible tensions between Tillerson and Trump regarding North Korea leave Chinese policymakers uncertain whether the United States will respect these injunctions. In addition, Chinese representatives reaffirmed their dual-suspension proposal – that South Korea and the United States cease major military exercises in exchange for Pyongyang’s freezing missile and nuclear tests. Wang still insists that the September 2005 Six-Party Talks Joint Statement offers a viable roadmap towards eventual Korean denuclearization. Yet, US officials have lost faith in the Six-Party Talks and reject such a freeze as leaving North Korea with excessive nuclear missile capacity. Maintaining JCPOA with Iran is crucial for achieving a similar negotiated settlement with North Korea, Wang suggests, as well as for buttressing the nuclear nonproliferation regime and global governance: The Iran deal demonstrates the benefits of resolving conflicts through diplomacy with Pyongyang and other potential nuclear aspirants. The Russian nonproliferation presentations deviated even more from the US stance. Like Wang, Russia’s Foreign Minister Sergey Lavrov affirmed that, “threats will only antagonize the countries that we want to influence” and instead we should engage in diplomacy with all parties. Russian UN Ambassador Vassily Nebenzia objected that the Security Council nonproliferation dialogue should focus on “general” issues rather than “someone’s idea of ‘pariah states’.” In the General Assembly, Lavrov denounced unilateral US sanctions applied without collective Security Council approval, especially extraterritorial ones that affect foreign firms. Any US nonproliferation concerns, he argued, should be addressed within the Security Council and other multilateral formats. Regarding the two immediate nonproliferation threats of Korea and Iran, Lavrov agreed with his Chinese counterpart that, while “it is inadmissible to watch silently North Korea’s missile gambling,” using military force “is equally inadmissible.” Rather than “military hysteria,” Lavrov called for implementation of the dual-freeze proposal, which Beijing and Moscow backed in a joint statemate in July, followed by comprehensive negotiations. Referencing Iran, Nebenzia said that, “if the United States does leave the JCPOA, this will be the worst signal we can send to North Korea.” Lavrov expressed fear that a US decision to unilaterally re-impose sanctions on Iran would undermine the credibility of promised collective sanctions relief to North Korea for denuclearization. Calling the agreement “one of the key factors of international and regional stability,” he said that Moscow would make its own judgment regarding Tehran’s implementation. The challenge for international diplomacy is that the gulf separating the United States from Russia and China extends well beyond nonproliferation issues. These trilateral nonproliferation divergences at the UN occurred in the context of continuing great power differences regarding general world order issues. While Trump emphasizes global terrorism, unfair trade deals and America First, Wang and Lavrov describe globalization as generally positive and affirm the primacy of multilateral diplomacy over unilateralism.